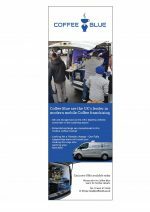 We built Coffee Blue from the ground up knowing we’d make the best coffee van around. Combining our passion for coffee and our aptitude for vehicle conversion, ours is the best vehicle on the road. When we looked at coffee vans we knew we could do better. It sounds bold, but so are we, so is our van and so are you. If you’re as adventurous as we are, join a franchise that helps you to be your best self. Over the past 5 years, the UK coffee market has experienced exceptional growth with the market expanding by 37% and estimated to be worth over £15 billion by 2020. There’s never been a better time to take the step towards self-employment in the coffee industry.